) and efflux (canalicular and sinusoidal) CLs of [3H]-RSV in SCRHs were evaluated in the presence and absence of Ca2+ and in the absence and presence of 1 mM unlabeled RSV (to estimate passive diffusion CL).
. Oatp expression in SCRHs was significantly lower than that in the rat liver. for Oatp protein expression. This is the first demonstration of the successful prediction of in vivo hepatobiliary CLs and hepatic concentrations of RSV using transporter-expressing cells and SCRHs. Hepatobiliary clearance (CL) of drugs is determined by transporter-mediated uptake, efflux, metabolism, or a combination of all three. 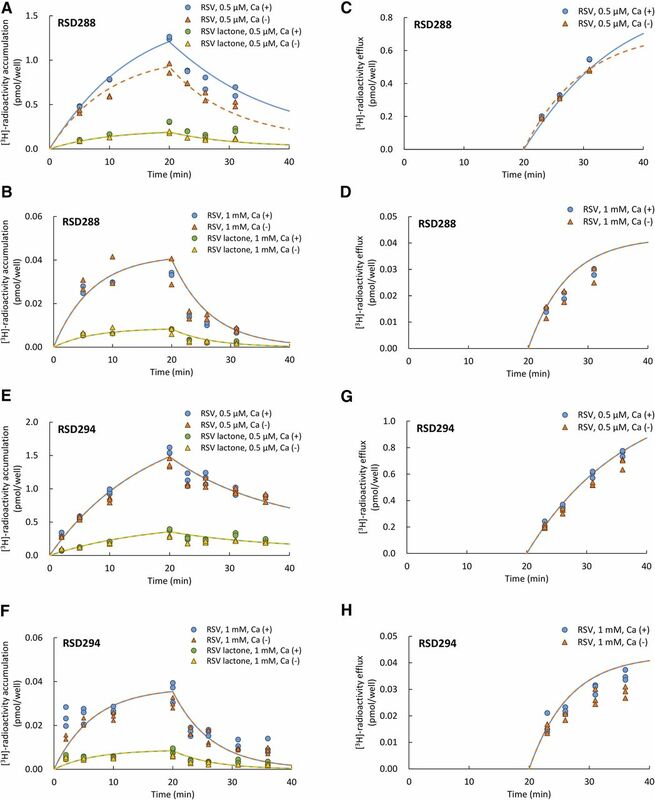 Predicting in vivo hepatobiliary CL of drugs from in vitro data [in vitro-in vivo extrapolation (IVIVE)] is important for drug development including determining first in human dose and anticipating drug-drug interactions. Although the IVIVE of the metabolic CL of drugs has been successful (Rostami-Hodjegan and Tucker, 2007; Soars et al., 2007; Rowland et al., 2011; Ke et al., 2014), the prediction of transporter-mediated CL remains a challenge (Abe et al., 2008; Zou et al., 2013). Sandwich-cultured hepatocytes (SCHs) are considered to be the gold standard for estimating in vivo transporter-mediated hepatobiliary CLs of drugs (Swift et al., 2010; Pfeifer et al., 2014). However, such predictions typically underestimate the in vivo hepatic CL of the drug (Watanabe et al., 2009; Jones et al., 2012; Zou et al., 2013), requiring empirical scaling factors (Jones et al., 2012; Ménochet et al., 2012; Zou et al., 2013; Kimoto et al., 2017). This empirical scaling factor is drug dependent and therefore cannot be generalized. Others have proposed use of the relative activity factor (RAF) approach when using human hepatocytes to predict transporter-mediated in vivo CL of drugs (Chapy et al., 2015). However, to date, the RAF approach has been used primarily to determine the fraction of drug transported by hepatocytes (Hirano et al., 2004, 2006; Yamashiro et al., 2006; Kitamura et al., 2008; Nakakariya et al., 2008a,b; Kunze et al., 2014). This is because the RAF can be used only when transporter-specific substrates are available for use both in vitro and in vivo. 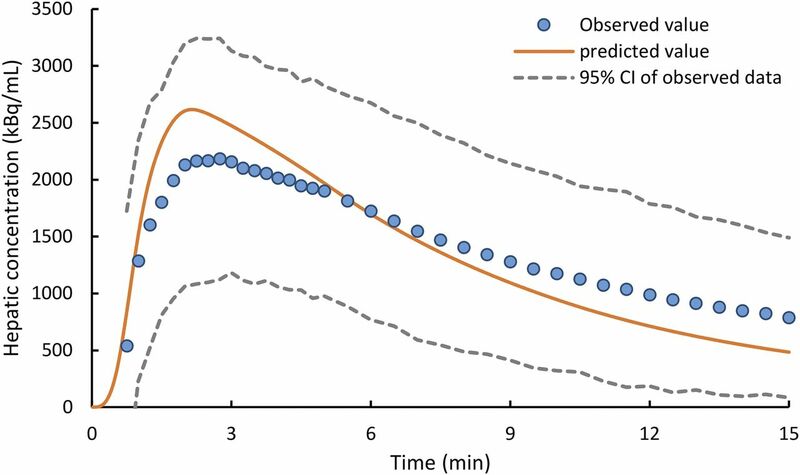 This requirement is a significant limitation for predicting organic anion transporting polypeptide (OATP)–dependent drug CL as most OATP substrates [e.g., rosuvastatin (RSV)] are transported by multiple OATPs. Therefore, alternative approaches are required to predict transporter-mediated CL of drugs. For this reason, we and others (Li et al., 2010; Bosgra et al., 2014; Prasad and Unadkat, 2015; Vildhede et al., 2016) have proposed that transporter-mediated hepatobiliary CL of drugs may be possible to estimate directly from transporter-expressing cell lines. The disadvantage of this approach is that the absolute abundance of the transporter protein in both the cell lines and liver tissue must be quantified. With the development of targeted quantitative proteomics, this disadvantage has been overcome (Ohtsuki et al., 2011; Bosgra et al., 2014; Prasad and Unadkat, 2014; Wang et al., 2015). Indeed, Bosgra et al. (2014) showed that the systemic CL of RSV in humans was well predicted using suspended primary human hepatocytes, OATP-expressing cell lines, and quantitative proteomics. In addition to systemic CL, it is also important to predict drug concentrations in the target tissue (in the case of RSV, hepatic concentration) to predict drug efficacy/toxicity and the prediction of drug-drug interactions. As stated above, our ultimate goal is to predict transporter-mediated hepatobiliary CL of drugs and hepatic concentrations directly from transporter-expressing cell lines. Therefore, as a first step toward achieving this goal, using RSV as our model drug, we determined whether Oatp transporter–expressing cell lines and quantitative proteomics combined with sandwich-cultured rat hepatocytes (SCRHs) can predict the in vivo transporter-mediated hepatobiliary CL and hepatic concentrations of RSV observed in our positron emission tomography (PET) imaging study (He et al., 2014). RSV (acid form) was purchased from Cayman Chemicals (Ann Arbor, MI). [3H]-RSV sodium salt (acid form; 20 mCi/mmol, radiochemical purity 99%) was purchased from American Radiolabeled Chemicals (St. Louis, MO). RSV lactone was purchased from Toronto Research Chemicals (Toronto, ON, Canada). All other chemicals were of reagent or analytical grade and were purchased from other commercial suppliers. Freshly isolated SCRHs (adult male SD rats) plated into 24-well plates were purchased from Triangle Research Labs (Durham, NC) or Qualyst Transporter Solutions (Durham, NC). According to vendor instructions, after receiving SCRHs, the shipping medium was changed to maintenance medium (purchased from the vendors). Then, the maintenance medium (purchased from the vendors) was changed every 24 hours. The uptake and efflux experiments were conducted at about 96 hours after plating. Uptake and Efflux of RSV in SCRH. The uptake and efflux of [3H]-RSV was evaluated as previously described (B-CLEAR Technology; Qualyst Transporter Solutions) (Pfeifer et al., 2013b) with minor modifications. Briefly, after washing SCRHs (0.35–0.4 × 106 cells/well) twice with 500 µl of prewarmed Ca2+/Mg2+-containing Hanks’ balanced salt solution [HBSS (hereafter referred to as Ca2+-containing HBSS)] or 500 µl of Ca2+/Mg2+-free HBSS with 1 mM EDTA (hereafter referred to as Ca2+-free HBSS), the SCRHs were first preincubated with 500 µl of Ca2+-containing HBSS or Ca2+-free HBSS (to disrupt the canalicular tight junctions) for 10 minutes at 37°C. The SCRHs were then incubated with 500 µl of 0.5 µM RSV containing 0.08–0.2 µCi/well [3H]-RSV in Ca2+-containing HBSS at 37°C. Then, at 2, 5, 10, and 20 minutes of incubation with 0.5 µM RSV, the Ca2+-containing HBSS was collected and SCRHs were washed twice with ice-cold Ca2+-containing or Ca2+-free HBSS. Then, 1 ml of 2% SDS was added to each well to lyse the cells (uptake phase). To evaluate the efflux of RSV from the SCRHs, after 10 minutes of preincubation with Ca2+-containing or Ca2+-free HBSS, the SCRHs were incubated with 500 µl of 0.5 µM RSV containing 0.08–0.2 µCi/well [3H]-RSV in Ca2+-containing HBSS at 37°C for 20 minutes. Then, Ca2+-containing HBSS was aspirated, and SCRHs were washed twice (500 µl) with ice-cold Ca2+-containing or Ca2+-free HBSS. Then, SCRHs were incubated with 500 µl of RSV-free Ca2+-containing or Ca2+-free HBSS for 2, 5, 10, and 15 minutes at 37°C. An aliquot of the Ca2+-containing and Ca2+-free HBSS was collected, and the SCRH were washed twice (500 µl) with ice-cold Ca2+-containing or Ca2+-free HBSS. Then, 1 ml of 2% SDS was added to each well to lyse the SCRHs (efflux phase). The total radioactivity in the samples was measured using a liquid scintillation counter (PerkinElmer, Waltham, MA). To inhibit all uptake transporters and to determine the passive diffusion uptake CL of the RSV into the hepatocytes, SCRHs were incubated with and without 1 mM unlabeled RSV throughout the above time periods. The total protein concentration of cell lysate was measured with Pierce BCA Protein Assay Kit (Thermo Fisher Scientific, Rockford, IL), according to the manufacturer instructions. Uptake and efflux experiments in the absence and presence of 1 mM unlabeled RSV were performed in six and five lots of SCRHs, respectively. Determination of RSV and RSV Lactone in SCRH Samples by High-Performance Liquid Chromatography Fractionation. Fifty to 100 µl of SCRH samples (both cell lysates and buffer) were mixed with the same volume of acetonitrile (containing 20 µM unlabeled RSV and 20 µM of RSV lactone). After centrifuging the samples at 16,000g and 4°C for 5 minutes, the supernatant (50–100 µl) was analyzed by high-performance liquid chromatography (HPLC) (Alliance 2695; Waters, Milford, MA). RSV and RSV lactone were separated on a ZORBAX SB-C8 column (Agilent, Santa Clara, CA) (3.5 µm, 4.6 × 100 mm) using a mobile phase (1 ml/min) consisting of 20 mM KH2PO4 (pH 2.5) and acetonitrile. The gradient was as follows: 40% acetonitrile (0–6 minutes); 40%–55% acetonitrile (6–10 minutes), 55% acetonitrile (10–20 minutes); 55%–80% KH2PO4 (20–22 minutes); 80% acetonitrile (22–27 minutes); 80%–40% acetonitrile (27–29 minutes); and 40% acetonitrile (29–30 minutes). UV absorbance of the analytes was monitored at 243 nm, and fractions were collected every minute for liquid scintillation counting. RSV and its lactone eluted at ∼12 and ∼17 minutes, respectively. To determine the percentages of RSV and RSV lactone in the samples, the radioactivity associated with the unlabeled RSV and RSV lactone was expressed as a percentage of total radioactivity collected in the fractions. Estimation of the Hepatobiliary CLs of RSV in SCRH. indicate the amount of [3H]-RSV in the Ca2+-containing and Ca2+-free HBSS, respectively. indicate the amount of [3H]-RSV in the cells incubated with Ca2+-containing and Ca2+-free HBSS, respectively. is the amount of [3H]-RSV in the bile pockets of SCRHs incubated with Ca2+-containing HBSS. indicate the amount of [3H]-RSV lactone in the cells incubated with Ca2+-containing and Ca2+-free HBSS, respectively. are the sinusoidal uptake, the sinusoidal efflux, and the biliary CLs of [3H]-RSV respectively. are the metabolic CLs of [3H]-RSV to the lactone, the metabolic CLs of [3H]-RSV lactone to [3H]-RSV, and the remainder of metabolic CLs of [3H]-RSV, respectively. RSV is converted to the lactone form (RSV lactone), and RSV lactone is back-converted to the acid form (Nezasa et al., 2002). In addition, RSV is metabolized to the pentenoic acid derivative (minor metabolite; remainder metabolic CL) in the rat liver (Nezasa et al., 2002; Pfeifer et al., 2013a). represent the volume of SCRHs (7.4 µl/mg protein) (Pfeifer et al., 2013b) and buffer (500 µl), respectively. were assumed to be invariant for the two concentration of unlabeled RSV (0.5 µM and 1 mM). RSV Uptake into CHO-Oatp1a1, HEK293-Oatp1a4, and HEK293-Oatp1b2 Expressing Cells. CHO-Oatp1a1, HEK293-Oatp1a4, HEK293-Oatp1b2, and their corresponding mock-transfected cells were a gift from SOLVO Biotechnology (Budaörs, Hungary). CHO-Oatp1a1 and CHO-mock cells, grown in 75-cm2 flasks, were harvested using trypsin and were plated at a density of 0.25 × 106 cells/cm2 in 24-well plates. These cells were incubated with 5 mM sodium butyrate about 24 hours before the transport experiments. HEK293-Oatp1a4, HEK293-Oatp1b2, and HEK293-mock cells, grown in a 75-cm2 flask with 3 µg/ml puromycin, were harvested using trypsin and plated at a density of 0.25 × 106 cells/cm2 in a 24-well poly-d-lysine–coated plates. These cells were also incubated with 3 µg/ml puromycin 24 hours before the transport experiments. The cells were washed three times with prewarmed Krebs-Henseleit (KH) buffer, then preincubated with the KH buffer at 37°C for 10 minutes. After preincubation, the cells were incubated with 500 µl of 0.07 µM RSV containing 0.2 µCi/well [3H]-RSV at 37°C for 5 seconds (Oatp1a1) or 15 seconds (Oatp1a4 and Oatp1b2), a time period over which the uptake of [3H]-RSV was assumed to be linear (Oatp1a1) or found to linear (Oatp1a4 and Oatp1b2; data not shown). The KH buffer containing RSV was aspirated, and the cells were washed three times with ice-cold KH buffer, and then 1 ml of 2% SDS was added to lyse the cells. The total radioactivity and total protein concentration in the samples were measured as described above. The transporter-mediated uptake was calculated by subtracting the uptake of the drug in the mock cells from that in the transfected cells. The Oatp-mediated uptake CL of RSV into each Oatp cell line was calculated as the ratio of the rate of transporter-mediated uptake (unlabeled plus labeled RSV; in picomoles per minute per milligram total protein) and the total concentration of RSV in the medium (0.07 µM). The passive diffusion-mediated uptake CL of RSV was calculated as above but using the uptake CL in mock-transfected cell lines. We also evaluated RSV uptake into CHO-Ntcp cells. However, RSV was not transported by Ntcp (data not shown). Quantification of Transporters in SCRHs and Transporter-Expressing Cell Lines Using Surrogate Peptides and Quantitative Proteomics. The total cell membranes of SCRHs (only sufficient cells were available for three of six lots) and Oatp-expressing cell lines were isolated using Calbiochem ProteoExtract Native Membrane Protein Extraction Kit (EMD Millipore, Billerica, MA) according to the manufacturer instructions. Cell membranes were then reduced, denatured, alkylated, and digested as previously described with minor modifications (Wang et al., 2015). That is, 80 µl of total membranes (0.3–0.6 mg/ml) were incubated with 10 µl of 250 mM dithiothreitol, 20 µl of 10% sodium deoxycholate, 10 µl of 10 mg/ml human serum albumin, and 40 µl of 100 mM ammonium bicarbonate (pH 7.8) at 95°C for 10 minutes. Then, the mixture was incubated with 20 µl of 500 mM iodoacetamide for 30 minutes at room temperature in the dark. To this mixture were added 0.5 ml of methanol, 0.1 ml of chloroform, and 0.4 ml of Milli-Q Water (EMD Millipore). After centrifuging the samples at 16,000g and 4°C for 5 minutes, the pellet was washed once with 1.0 ml of methanol and resuspended in 60 µl of 50 mM ammonium bicarbonate. The extracted proteins were digested with 20 µl of 0.16 µg/µl trypsin at 37°C for 18 hours. The digestion was stopped by adding 20 µl of a chilled labeled peptide internal standard cocktail (in 80% acetonitrile solution with 0.2% formic acid) (Supplemental Table 2), and the samples were centrifuged at 5000g and 4°C for 5 minutes. Finally, 5 µl of the supernatant was injected onto a LC-tandem mass spectrometry (LC-MS/MS) system to quantify the expression of the Oatp transporters in total cell membranes (expressed as femtomoles per microgram membrane protein). from In Vitro to In Vivo. into the Oatp transporter-expressing cell line (i.e., Oatp 1a1, 1a4, or 1b2). provides the best estimate of the observed in vitro (SCRHs) or in vivo CLs,uptake was also examined (see Results). , respectively. Statistically significant differences between the various groups were determined by the Welch’s t test (corrected for multiple comparisons). Simulation of Hepatic Concentrations of RSV Using Hepatobiliary CLs of RSV Estimated from Oatp-Expressing Cells and SCRH. were fixed as reported previously (He et al., 2014). Cellular Accumulation and Efflux of [3H]-RSV and Estimation of Hepatobiliary CL of RSV in SCRH. The morphology of SCRHs was good (Supplemental Fig. 1), and the biliary excretion index values of taurocholic acid were reasonable or lower than expected (Supplemental Table 3) (Lee et al., 2010; Li et al., 2010). The mean percentages of [3H]-RSV and [3H]-RSV lactone (in the absence of 1 mM unlabeled RSV) were 67%–78% and 13%–21% in cell lysate samples (Supplemental Table 4). The percentage of RSV in SCRHs was similar to that reported previously (Nezasa et al., 2002). In contrast, all the radioactivity in the buffer samples in the absence of 1 mM unlabeled RSV was in the acid form (Supplemental Table 4). However, due to much lower total cellular radioactivity in the presence of 1 mM unlabeled RSV, we could not quantify the percentage of [3H]-RSV and [3H]-RSV lactone in the cell lysates or the buffer samples (data not shown). The mean cellular content values of [3H]-RSV and [3H]-RSV lactone in the SCRHs were used to estimate the hepatobiliary CLs of RSV described below. could be estimated in only these three lots of SCRHs (Supplemental Table 3; Table 1). The cellular accumulations of [3H]-RSV and [3H]-RSV lactone and [3H]-RSV efflux into the buffer in the presence of 1 mM unlabeled RSV were much lower than that in the absence of 1 mM unlabeled RSV [Fig. 1; Supplemental Fig. 2 (note the difference in scale of the y-axis)]. in the presence of 1 mM unlabeled RSV could not be estimated and was fixed to 0. Typical observed and predicted cellular accumulation and efflux profiles of [3H]-RSV in two lots of SCRHs, each showing modest (RSD288) or no (RSD294) biliary efflux of RSV. Circles/solid line and triangles/dashed line indicate the observed/predicted [3H]-RSV and [3H]-RSV lactone cellular accumulation (A, B, E, and F) or efflux (C, D, G, and H) of [3H]-RSV into the buffer with Ca2+-containing and Ca2+-free HBSS, respectively. The small difference (RSD288) or lack of difference (RSD294) in the cellular accumulation of [3H]-RSV between Ca2+-containing and Ca2+-free HBSS indicate modest or no biliary efflux of [3H]-RSV. (B, D, F, and H) The [3H]-RSV profiles in the presence of unlabeled 1 mM RSV. Data are the mean ± S.D. of six lots (in the presence of 0.5 µM unlabeled RSV) or five lots (in the presence of 1 mM unlabeled RSV) of SCRH. Comparison of Hepatobiliary CL of RSV and Oatp Expression in SCRHs with That Observed In Vivo. was underestimated by SCRHs, we determined whether this was due to the difference in expression of Oatps in our SCRHs versus SD liver tissue. Indeed, the expression of all of the Oatps was significantly lower in SCRHs than that in SD liver tissue (Fig. 3). *P < 0.05, significantly different from our previous PET imaging study. 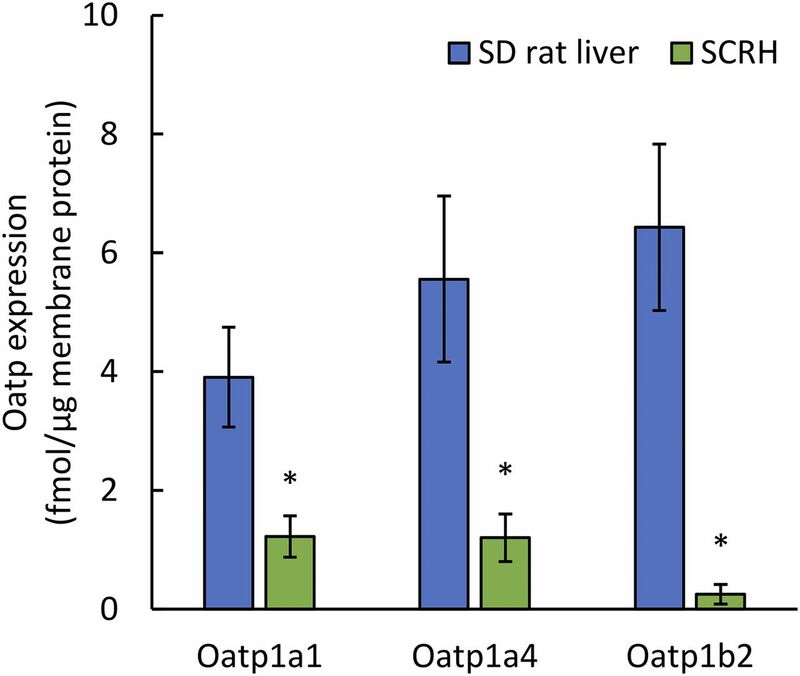 Oatp protein expression in the SD rat liver and SCRHs. The expression of Oatp transporter proteins in SCRHs was significantly lower than that in the rat liver [data are from the study by Wang et al. (2015)]. The data shown are the mean ± S.D. of six SD rat livers and three lots of SCRHs. *P < 0.05, significantly different from SD rat livers. in Oatp-Expressing Cells to That in SCRH (In Vitro-to-In Vitro) or That In Vivo Based on Oatp Transporter Expression. Data are the mean ± S.D. of triplicate determination. Transporter-mediated uptake CL of RSV was calculated as the ratio of RSV transporter-mediated uptake (uptake in transfected cells minus that in mock cells) over 5 s (Oatp1a1) or 15 s (Oatp1a4 and Oatp1b2) and the total buffer RSV concentration (0.07 µM). Data shown are the mean ± S.D. of five lots (SCRHs), three independent experiments (CHO-mock cells), or six independent experiments (HEK293-mock cells). was estimated from SCRH, CHO-mock cells or HEK293-mock cells (Fig. 4B). Simulation of Hepatic RSV Concentrations Predicted by Transporter-Based Scaling of RSV Hepatobiliary CL. values fell within the 95% CI of the concentrations in our previous PET imaging study, suggesting no significant difference between the observed and predicted hepatic concentrations (Fig. 5). values from SCRHs (see Materials and Methods), fell within the 95% CI of the observed concentrations in our previous in vivo PET imaging study (blue circles and gray dashed lines) (He et al., 2014), suggesting an excellent agreement between the observed and predicted hepatic RSV concentrations. ). Therefore, we estimated all the CLs involved in hepatobiliary CL of RSV in SCRHs. 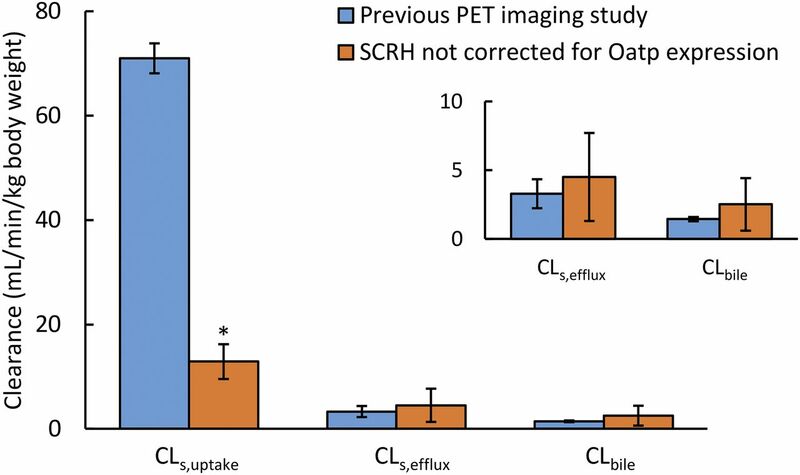 Since we had estimates of all these values from our PET imaging study, we were able to compare the values obtained from SCRHs with those observed in vivo. Our goal was to predict the hepatobiliary CL of RSV within 2-fold to 3-fold of the observed value, since such range of prediction is widely accepted as adequate for IVIVE (Rostami-Hodjegan and Tucker, 2007; Rowland et al., 2011). of [3H]-RSV; and 3) metabolites of RSV in SCRH may have stimulated sinusoidal efflux transport (if any) of RSV. RSV is reported to be a substrate of human multidrug resistance–associated protein (MRP) 4, but there are no reports whether rat sinusoidal efflux transporters, such as Mrp3 and Mrp4, can transport RSV. In addition, we have previously reported that Mrp4 in the rat liver tissue and cryopreserved hepatocytes was not detectable by LC-MS/MS (Wang et al., 2015). Further studies are needed to characterize the sinusoidal efflux of RSV and its metabolites in SCRHs. values of RSV determined in SCRHs were not significantly different from those observed in vivo (Fig. 2). (RSD279, RSD288, and Rs14Dec15T) and where it was not measurable (RSD270, RSD294, and Rs18Jan16T). using SCRHs, mock-transfected CHO cells, or HEK293 cells. value is significant, this value be estimated from SCHs (using selective inhibitors of the uptake transporter) or HEK293-mock cells. are almost identical, the latter would also predict the observed hepatic concentrations of RSV equally well in our PET imaging study. Our proposed approach has some limitations. First, it requires that the quantitative targeted proteomics method be available. Second, it assumes that the transporter abundance measured reflects functional transporters present on the cell surface. The latter is partially overcome by quantifying cell surface expression of the transporter using a refined biotinylation method that we have recently published (Kumar et al., 2017). values from cell lines to in vivo (eq. 9) (see Materials and Methods). There is no reason why this approach could not be used to also predict sinusoidal and canalicular efflux CL of drugs, thus avoiding the use of SCHs and the disadvantage of the RAF approach inherent to Oatp substrates. Therefore, we propose that studies be conducted to determine whether our approach can be generalized to successfully predict hepatobiliary CL and hepatic concentrations of drugs other than RSV, especially in humans. This, of course, will require that data from imaging studies in humans are available. Fortunately, such data are becoming increasingly available (Shimizu et al., 2012; Takashima et al., 2012). We thank Dr. Bhagwat Prasad and Dr. Sarah Billington for technical help in LC-MS/MS protein quantification. Participated in research design: Ishida, Ullah, and Unadkat. Contributed new reagents or analytic tools: Tóth and Juhasz. Wrote or contributed to the writing of the manuscript: Ishida, Ullah, Tóth, Juhasz, and Unadkat. This work was supported by a Postdoctoral Fellowship to K.I. from F. Hoffmann-La Roche Ltd.
(2008) In vitro biliary clearance of angiotensin II receptor blockers and 3-hydroxy-3-methylglutaryl-coenzyme A reductase inhibitors in sandwich-cultured rat hepatocytes: comparison with in vivo biliary clearance. J Pharmacol Exp Ther 326:983–990. (2015) Meta-analysis of expression of hepatic organic anion-transporting polypeptide (OATP) transporters in cellular systems relative to human liver tissue. Drug Metab Dispos 43:424–432. 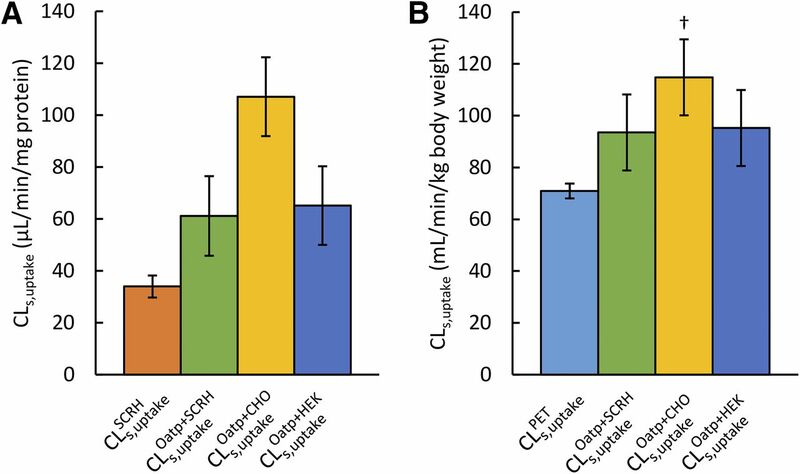 (2013) Quantitative assessment of the contribution of sodium-dependent taurocholate co-transporting polypeptide (NTCP) to the hepatic uptake of rosuvastatin, pitavastatin and fluvastatin. Biopharm Drug Dispos 34:452–461. (2014) Predicting carrier-mediated hepatic disposition of rosuvastatin in man by scaling from individual transfected cell-lines in vitro using absolute transporter protein quantification and PBPK modeling. Eur J Pharm Sci 65:156–166. (2015) PBPK modeling of irbesartan: incorporation of hepatic uptake. Biopharm Drug Dispos 36:491–506. (2008) Effect of plasma protein binding on in vitro-in vivo correlation of biliary excretion of drugs evaluated by sandwich-cultured rat hepatocytes. Drug Metab Dispos 36:1275–1282. (2014) PET imaging of Oatp-mediated hepatobiliary transport of [(11)C] rosuvastatin in the rat. Mol Pharm 11:2745–2754. (2004) Contribution of OATP2 (OATP1B1) and OATP8 (OATP1B3) to the hepatic uptake of pitavastatin in humans. J Pharmacol Exp Ther 311:139–146. (2006) Drug and bile acid transporters in rosuvastatin hepatic uptake: function, expression, and pharmacogenetics. Gastroenterology 130:1793–1806. (2012) Mechanistic pharmacokinetic modeling for the prediction of transporter-mediated disposition in humans from sandwich culture human hepatocyte data. Drug Metab Dispos 40:1007–1017. (2014) Expansion of a PBPK model to predict disposition in pregnant women of drugs cleared via multiple CYP enzymes, including CYP2B6, CYP2C9 and CYP2C19. Br J Clin Pharmacol 77:554–570. (2017) Hepatobiliary clearance prediction: species scaling from monkey, dog, and rat, and in vitro-in vivo extrapolation of sandwich-cultured human hepatocytes using 17 drugs. J Pharm Sci 106:2795–2804. (2008) Involvement of multiple transporters in the hepatobiliary transport of rosuvastatin. Drug Metab Dispos 36:2014–2023. (2011) Culture period-dependent changes in the uptake of transporter substrates in sandwich-cultured rat and human hepatocytes. Drug Metab Dispos 39:1503–1510. (2015) Quantitative transporter proteomics by liquid chromatography with tandem mass spectrometry: addressing methodologic issues of plasma membrane isolation and expression-activity relationship. Drug Metab Dispos 43:284–288. (2017) Optimization and application of a biotinylation method for quantification of plasma membrane expression of transporters in cells. AAPS J [published ahead of print]. (2014) Prediction of organic anion-transporting polypeptide 1B1- and 1B3-mediated hepatic uptake of statins based on transporter protein expression and activity data. Drug Metab Dispos 42:1514–1521. (2010) Sulindac and its metabolites inhibit multiple transport proteins in rat and human hepatocytes. J Pharmacol Exp Ther 334:410–418. (2010) Improved extrapolation of hepatobiliary clearance from in vitro sandwich cultured rat hepatocytes through absolute quantification of hepatobiliary transporters. Mol Pharm 7:630–641. (2012) Use of mechanistic modeling to assess interindividual variability and interspecies differences in active uptake in human and rat hepatocytes. Drug Metab Dispos 40:1744–1756. (2008a) Predominant contribution of rat organic anion transporting polypeptide-2 (Oatp2) to hepatic uptake of beta-lactam antibiotics. Pharm Res 25:578–585. (2008b) Identification and species similarity of OATP transporters responsible for hepatic uptake of β-lactam antibiotics. Drug Metab Pharmacokinet 23:347–355. (2002) Pharmacokinetics and disposition of rosuvastatin, a new 3-hydroxy-3-methylglutaryl coenzyme A reductase inhibitor, in rat. Xenobiotica 32:715–727. (2011) Quantitative targeted absolute proteomics-based ADME research as a new path to drug discovery and development: methodology, advantages, strategy, and prospects. J Pharm Sci 100:3547–3559. (2016) Transport vs. metabolism: what determines the pharmacokinetics and pharmacodynamics of drugs? insights from the extended clearance model. Clin Pharmacol Ther 100:413–418. (2013a) Hepatic basolateral efflux contributes significantly to rosuvastatin disposition II: characterization of hepatic elimination by basolateral, biliary, and metabolic clearance pathways in rat isolated perfused liver. J Pharmacol Exp Ther 347:737–745. (2013b) Hepatic basolateral efflux contributes significantly to rosuvastatin disposition I: characterization of basolateral versus biliary clearance using a novel protocol in sandwich-cultured hepatocytes. J Pharmacol Exp Ther 347:727–736. (2014) Role of hepatic efflux transporters in regulating systemic and hepatocyte exposure to xenobiotics. Annu Rev Pharmacol Toxicol 54:509–535. (2014) Comparison of heavy labeled (SIL) peptide versus SILAC protein internal standards for LC-MS/MS quantification of hepatic drug transporters. Int J Proteomics 2014:451510. (2015) The concept of fraction of drug transported (ft ) with special emphasis on BBB efflux of CNS and antiretroviral drugs. Clin Pharmacol Ther 97:320–323. (2007) Simulation and prediction of in vivo drug metabolism in human populations from in vitro data. Nat Rev Drug Discov 6:140–148. (2011) Physiologically-based pharmacokinetics in drug development and regulatory science. Annu Rev Pharmacol Toxicol 51:45–73. (2012) Whole-body distribution and radiation dosimetry of [11C]telmisartan as a biomarker for hepatic organic anion transporting polypeptide (OATP) 1B3. Nucl Med Biol 39:847–853. (1997) Organ clearance concepts: new perspectives on old principles. J Pharmacokinet Biopharm 25:449–470. (2007) The pivotal role of hepatocytes in drug discovery. Chem Biol Interact 168:2–15. (2010) Sandwich-cultured hepatocytes: an in vitro model to evaluate hepatobiliary transporter-based drug interactions and hepatotoxicity. Drug Metab Rev 42:446–471. (2012) PET imaging-based evaluation of hepatobiliary transport in humans with (15R)-11C-TIC-Me. J Nucl Med 53:741–748. (2016) Mechanistic modeling of pitavastatin disposition in sandwich-cultured human hepatocytes: a proteomics-informed bottom-up approach. Drug Metab Dispos 44:505–516. (2015) Interspecies variability in expression of hepatobiliary transporters across human, dog, monkey, and rat as determined by quantitative proteomics. Drug Metab Dispos 43:367–374. (2009) Physiologically based pharmacokinetic modeling to predict transporter-mediated clearance and distribution of pravastatin in humans. J Pharmacol Exp Ther 328:652–662. (2010) Use of cassette dosing in sandwich-cultured rat and human hepatocytes to identify drugs that inhibit bile acid transport. Toxicol In Vitro 24:297–309. (2006) Involvement of transporters in the hepatic uptake and biliary excretion of valsartan, a selective antagonist of the angiotensin II AT1-receptor, in humans. Drug Metab Dispos 34:1247–1254. (2013) Comparison of in vitro-in vivo extrapolation of biliary clearance using an empirical scaling factor versus transport-based scaling factors in sandwich-cultured rat hepatocytes. J Pharm Sci 102:2837–2850.